I realized when I saw this image that I was doing it all wrong! Oops. The next time I decided to use NYM Clean Freak, I devised a styling plan. I like to wear my hair in pigtail braids sometimes when I wash my hair and don’t have time to style. Not only does it look cute, but it’s quick and easy. The best part about putting my hair in braids is how my hair looks the next day! When I take my braids out, my hair always looks like I spent hours crimping and adding waves… meanwhile, all I really did was let it dry while my hair was in braids the day before! So while it’s easy to achieve that style, I usually do feel guilty going out with my hair down because it’s unwashed. Not anymore, thanks to Not Your Mother’s Clean Freak Dry Shampoo! One of my favorite features about this dry shampoo is the scent. When you spray it on your roots, there is a very nice baby powder scent that definitely helps to freshen up your hair. Basically, NYM Clean Freak Dry Shampoo does double duty – it helps to get rid of oils from your scalp, AND it makes your hair smell fresh. It’s the next best thing to actually washing your hair! Don’t get me wrong, I love washing my hair. However, I have a lot of gray hair and therefore end up dying my hair quite often. My stylist told me that I actually should NOT wash my hair every day, because it will make my color fade a lot faster. Further research showed me that it’s really not good for anyone to wash their hair daily, because it strips your hair of natural oils that make your hair look shiny. So, for the sake of your hair, try Not Your Mother’s Clean Freak Dry Shampoo, and save yourself some time getting ready to go out! 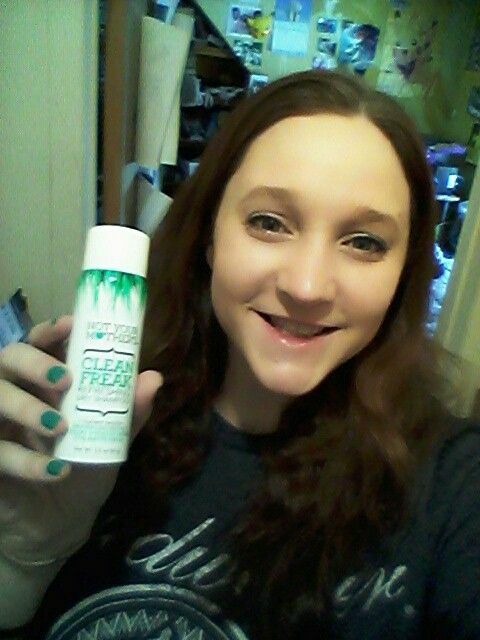 I received this product complimentary from Influenster for testing purposes. If you would like to join Influenster Nation and gain opportunities to receive free products like this, please post your email address in a comment here on this blog, or PM me on Twitter (@gluxbox) for details!